A union is warning of travel chaos over the Christmas period at four major UK airports, unless a baggage carrier transfers staff to other companies. Unite says it understands that Aviator planned to close its operations at Birmingham, Gatwick, Manchester and Newcastle airports for financial reasons. The Scandinavian firm will close its operations at the end of November, but Unite says it wants clarity about what it is planning to do to ensure smooth continuity of check-in, refuelling, and baggage handling services. "We remain in close co-operation with the unions as well as other stakeholders. Our focus is on maximising employment and meeting the needs of our airline customers while minimising disruption and we are working tirelessly to achieve that goal well in advance of the Christmas travel period." Passengers flying from Gatwick Airport in the run up to Christmas could face further problems as unions threaten to strike over a pension dispute. 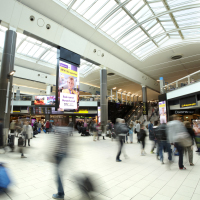 Workers are preparing to vote on whether to take industrial action in response to a decision by the company that owns Gatwick -Global Infrastructure Partners (GIP) - to close the final salary pension scheme because of a reported £90 million shortfall.